It's one of your favorite paste waxes - in liquid form! McKee's 37 Trademark Poli Coat Wax is a liquid wax that imparts a dazzling, 3-dimensional shine that complements all colors. Formulated with Brazilian carnauba wax and slick synthetic polymers, McKee's 37 Trademark Poli Coat Wax is easy to apply and leave a glossy and protective shell on your paint. Built-in bonding agents prep the surface, enhancing gloss while creating a foundation for long-lasting paint protection. One of McKee's 37 stand-out products is their Brazilian carnauba paste wax, Trademark. Known for at least 2 months of protection, it's advanced UV resistance capabilities, and the multi-dimensional shine of your paint, McKee's 347 Trademark Carnauba Paste Wax is one of the best. McKee's 37 Trademark Poli Coat Wax takes those same features and liquifies them! That's where McKee's 37 Trademark Poli Coat Wax came from. McKee's 37 Trademark Poli Coat Wax is a super blend of Brazilian carnauba wax and synthetic polymers that come together to provide a thick, glossy shell of protection that withstands even the harshest climate. The gloss imparted by just one layer of McKee's 37 Trademark Poli Coat Wax is reminiscent of your favorite carnauba wax! A built-in bonding agent primes the surface for McKee's 37 Trademark Poli Coat Wax, enhancing gloss while creating a foundation for long-lasting protection. Check out McKee's 37 Trademark Poli Coat Wax today, your paint will thank you! McKee's 37 Trademark Poli Coat Wax is easily applied with a wax applicator. Once dry and hazed, it's ready to buffed off and start shining! For best results, your vehicle should be washed, clayed, and polished before treatment with McKee's 37 Trademark Poli Coat Wax. Shake product well. Apply a nickel-sized amount of product directly onto a soft foam applicator pad. Evenly spread out a thin coat. Add more wax to your applicator as needed. After applying to entire vehicle, allow wax to dry to a haze - up to 30 minutes. Buff off using a clean, dry microfiber towel. 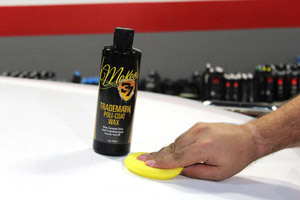 McKee's 37 Trademark Poli Coat Wax can be applied by hand or by machine! McKee's 37 Trademark Poli Coat Wax 128 oz.